RT – January 5, 2018: By calling a UN Security Council meeting with the demand to support anti-government protesters in Iran, the US is trying to bend the UNSC mandate, which does not deal with countries’ internal affairs, the Russian envoy said. “We obviously regret the loss of lives as a result of the demonstrations that were not so peaceful. However, let Iran deal with its own problems, especially since this is precisely what’s taking place,” Russian envoy to the UN Vasiliy Nebenzia said. Vassily Nebenzia slammed the US for diverting attention from important international issues the UN Security Council should be addressing. RT – January 5, 2017: An emergency UN Security Council meeting, to discuss the mass anti-government protests that engulfed Iran, has finished up in New York. The session was called by Washington, which has voiced its strong support for the demonstrators. 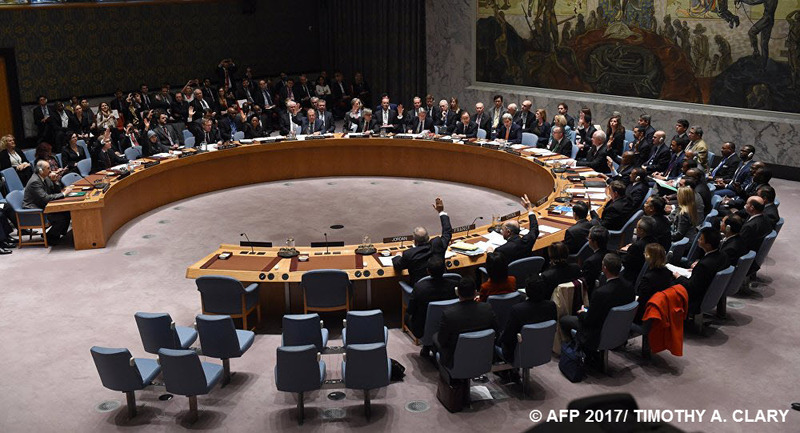 BATTLEFORWORLD – December 25, 2017: The United States appear as if it wants to control and direct the United Nations into supporting its geopolitical interests worldwide. And now Nikki Haley, the U.S. ambassador to the U.N. is becoming aware that opposition to the United States geopolitical and unilateral plans are not at all times accepted by the United Nations member body. The United States began to notify the United Nations about pending budget cuts, because Haley said that the generosity of the American people, but that should read “the ruling-elites”, is being taken advantage of. But much of what the United States is forcing the United Nations to do, no vote has ever been put to the American people asking for their approval. The United States budget is being drained nonstop into funding foreign policy wars for decades leaving very little for the American people way of life. And maybe the United States is falling short on funds to continue buying its interest and support in foreign policy adventurism? And over the many decades the United Nations assembly has been drawn into quarreling with other member states and have become dysfunctional. And the question becomes, will the United Nations organization eventually disband? We still have some ways to go for that, until diplomatic relations are no longer repairable and state members begin to withdraw from the UN organization, because the United States Corporation is in disarray. RT – December 26, 2017: The U.S. government has decided to slash its contribution to the United Nations budget, for the coming year. Ambassador Nikki Haley gave a statement, explaining the move. YAHOO – December 25, 2017: The U.S. government says it has negotiated a significant cut in the United Nations budget. And the U.S. Mission to the United Nations said on Sunday (December 24) that the U.N.’s 2018-2019 budget would be slashed by over $285 million. The mission said reductions would also be made to the U.N.’s management and support functions. 2. The order we will all see into 2050 AD is a Multi-polar World Order. This means that all countries will be at the decision table and contribute, mutual respect; and all countries will keep their sovereignty. This order will come about after the chaos is over and evil-doings are subdued. The United Nations in New York has become dysfunctional because of the United States, allies and the “ruling elites”, and will eventually disband. And a new UN-like organization will be located elsewhere for all the countries to gather and such an idea is already drafted and dormant – the framework is written-up for the new charter. SPUTNIKNEWS – January 5, 2018: The Iranian government has hard evidence that the violence in the ongoing protests in the country is incited from abroad, Iranian Ambassador to the United Nations Gholam Ali Khoshroo said during an emergency UN Security Council meeting. “We have hard evidence of the violence in Iran by a handful of the protesters, in some cases resulting in the deaths of policeman and security officers, being very clearly directed from abroad,” Khoshroo said on Friday. Iranian Envoy to the UN Gholam Ali Khoshroo also stressed that the United States is abusing its power as a member of the United Nations Security Council and as a permanent member of the council by calling a meeting to discuss the protests in Iran. “The move by the United States to bring to this council protests in Iran by some of our citizens for legitimate grievances some exacerbated by none other than US itself in its dereliction of its obligation under the Joint Comprehensive Plan of Action [JCPOA] is an abuse of its power as a permanent member and an abuse of the council itself,” Khoshroo said on Friday.